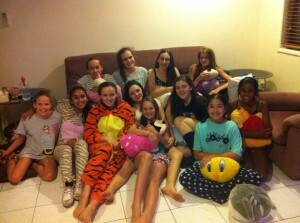 This weekend the senior girls had a PJ party movie night, just as an excuse to catch up and hang out, and to welcome some of the new high school girls to the senior group of students. I love fostering a community of learners, allowing the advanced students to form friendships and move piano practice from an isolated activity into a collaborative effort. The girls welcomed the newest Grade 8s to this senior group, and had a fun night watching movies and chilling out in their PJs catching up on life. I’m taking suggestions for next term already – so far i’ve had requests for a pizza party and a picnic! This entry was posted in Uncategorized on February 23, 2014 by Thembi.